Recent release “Porter Brothers’ Tragedy: The Untold Story” from Page Publishing authors Glenn and Steven W. Porter is both suspenseful and perplex; this work is a page-turner that keeps the reader intrigued. Glenn and Steven W. Porter, are brothers, devoted writers and authors. They together have completed their newest work “Porter Brothers’ Tragedy”: a gripping and potent tale of intrigue, mystery and manipulation with several unexpected moments. Published by New York City-based Page Publishing, The Porter brothers’ chilling work tells a story of survival and courage. The Porter brothers, Glenn and Steven, were in their twenties and had their whole lives in front of them. They found jobs and worked at a business where the wealthy owners had two beautiful daughters. Glenn and Steven pursued these two girls with hopes of marriage. The Porters eventually quit working at the business, and everything turned against them. The two daughters labeled the Porter Brothers as runners, men who run away from the responsibility of marriage, while their rich parents put out a statewide man hunt alert for the state of Maine. The Porters were blacklisted statewide. Their story caught on like wildfire through the rest of Maine. Many people were jealous that they could become rich overnight by marrying these two wealthy daughters. There would be more than one murder attempt on the Porter brothers’ lives in order to prevent them from becoming rich. 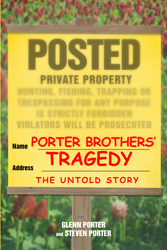 This is the Porter Brothers’ Tragedy, filled with romance, violence, and stories of torture and disappointed hopes. Readers who wish to experience this profound work can purchase“Porter Brothers’ Tragedy: The Untold Story” at bookstores everywhere, or online at the Apple iTunes store, Amazon, Google Play or Barnes and Noble.